MSU-S catalyst, assembled from ZSM-5 zeolite seed (MFI), was synthesized with silica to alumina ratio 55 and characterized by XRD, NH3-TPD, BET and FT-IR techniques. 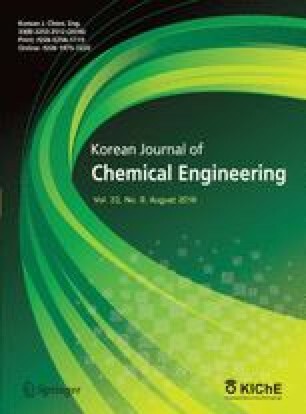 It was tested in a vertical fixed bed reactor for selective production of light olefins from methanol (MTO) at temperatures of 400, 450 and 500 °C and WHSV of 1, 5 and 25 h−1. After thorough investigation, it was found that WHSV=5 h−1 and temperature of 500 °C are the optimum conditions for maximum light olefin yield, which was 52% with propylene to ethylene ratio of 4.57. Acidity of MSU-S was promoted by incorporation of phosphotungusticacid (HPW) and a direct method to reach high HPW dispersion and thermal stability. Maximum light olefin yield was observed over HPW-MSU-S at the optimum reaction conditions to be nearly 60% with propylene to ethylene ratio of 4.3.